A 3 mile walk between Blackfriars and Cannon Street stations taking in a number of the 38 livery halls remaining in London. Historical and architectural information about the halls can be found on a separate page [click here]. Remember that the city 'shuts down' at the weekend. You may prefer the peace and quiet but I always find it rather forlorn! From Blackfriars Station use the subway system to exit 1. Go around the Blackfriar pub and left along Blackfriars Lane. On the right just beyond Playhouse Yard is the APOTHECARIES. Since 1815 the society has held the right to grant, after examination, a license to practise medicine. The hall is shared with the SPECTACLE MAKERS. Continue along Blackfriars Lane and Ludgate Broadway going right at Pilgrim Street and right along Ludgate Hill. Follow signs to Stationers Hall on the left. The STATIONERS and NEWSPAPER MAKERS have combined. Exit into Ave Maria Lane and go left continuing along Warwick Lane. Notices on the railings of the CUTLERS explain the working processes depicted on the frieze. The hall is shared with the SOLICITORS and PAVIOURS. At the end of Warwick Lane go left along Newgate Street and right into Giltspur Street. At West Smithfield go to the left. The HABERDASHERS occupy the newest hall (opened in 2002). From West Smithfield go along Cloth Fair. At the end bear left along Little Britain then right into King Edward Street. Go through Postman's Park to the left. Cross Aldersgate to the corner with London Wall. There is a plaque recording the site of the COOKS hall, destroyed by fire. Go along London Wall to the junction with Noble Street. Across London Wall is a view of the BARBERS. These are now separated from the surgeons they were once linked to. 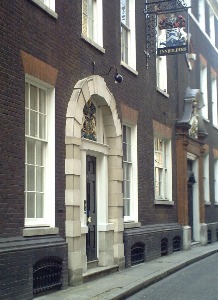 The PLAISTERERS premises are within One London Wall. From Noble Street go left into Oat Lane. The Haberdashers were previously on the site and the replacement property has company badges. At the end is a view across to the WAX CHANDLERS. Go along Goldsmith Street, left into Wood Street, right at Gresham Street and left into Aldermanbury. The GUILDHALL has associations with the Livery Companies [more info]. At the end of Aldermanbury on the right is the INSURERS (sharted with the FIREFIGHTERS) and in Aldermanbury Square is the BREWERS. On the left is the GIRDLERS. The private road runs alongside and is the property of the DRAPERS. Return westwards along Threadneedle Street to the Bank junction then go along Poultry. At the end of Grocers Hall Court on the right are the GROCERS. Return to and continue along Poultry and then Cheapside. Cannon Street Station is at the end of this street.